Answering that question properly leads to asking other core questions about budgets, timing, audience, competitors and the nature of the product, service or activity being disseminated. And unless the endeavor is a pure internet play or an intended traditional-only communication, it’s extremely rare to use one without the other in a complementary fashion. Print ads, flyers, direct mail, radio and TV commercials and outdoor advertising are all examples of the kind of traditional marketing we grew up with. Building a website, advertising on Facebook, LinkedIn, and Twitter, posting content to them, creating videos for YouTube and Vimeo, or running banner ads on relevant websites as well as Google ads, are all examples of digital marketing. There is a plethora of other examples that can be applied to traditional and digital methods. With Traditional Marketing the physical materials can be kept for review again and again. Everyone is familiar with how to use the materials. In broadcast, you’re getting the added benefit of sight, sound and motion to make an impression. Studies have shown that traditional hard copy materials are easier for our brains to process and test better for brand recall. For example, post-exposure memory tests show that recall was 70% higher among participants who were exposed to a direct mail piece (75%) than a digital ad (44%). Physical material is more “real” to the brain. It has a meaning, and a place. It is better connected to memory because it engages with its spatial memory networks. Physical material involves more emotional processing, which is important for memory and brand associations. Physical materials produced more brain responses connected with internal feelings, suggesting greater “internalization” of the ads. Because of this, print marketing can be used effectively with a digital campaign. 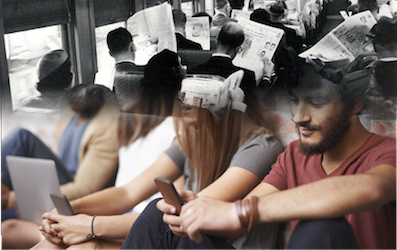 In the old days, everyone got their news from TV, radio or newspaper. Now, the internet and social media platforms reign supreme for news, followed by TV. Print appears to no longer be relevant because the news is already old by the time it appears in a paper or magazine. However, the way we are using the medium has evolved. With print, readers are more receptive to insightful content, depth, length and detail than with digital. They can select to read it over time and are usually as not as distracted or multi-tasking as they are when consuming digital media. This means you can potentially have a greater connection with your audience by providing more of the “why” and “how” versus just the “what” that quick a digital information snippet might provide. In concert with a digital program to generate awareness and interest, it can pay it off over time with a more traditional, print-centered follow-up. Like Traditional Marketing, Digital Marketing allows you to target a local audience, but it can also target an international one. While you can purchase some print, broadcast media or direct mail to target a demographic audience, digital allows you better market segmentation – the ability to create your own audience based on your more specific demographics. You can better choose who is receiving your message. Your audience can also choose how to receive your content – blog, YouTube, Social Media, Website, Mobile Phone, etc. Because the audience is in charge, digital marketing fosters audience interaction in ways that Traditional Marketing cannot. Because of its ability for instantaneous feedback, campaigns can be tested, modified, refined and then refreshed again as they lose their effectiveness. Digital allows for more flexibility, adaptability and the ability to pivot in real time based on your customer interactions. Done well, digital marketing can be very cost-effective vs. many traditional methods. Plus, data and results are easily collected for analysis. Digital campaigns can level the playing field for smaller businesses to compete with larger competitors. A strategic, well executed customer journey online – providing a positive customer experience – can win the day. Also, customers, whether B-to-B or B-to-C, expect that viable businesses and brands have an online presence that includes a website available and functioning on any device. This allows marketers’ messaging to be available wherever their customers are. Depending on the product or service, having a current account on social media – Facebook, Twitter, LinkedIn, YouTube, Instagram, etc. – is also key as they provide the ability for viral marketing/sharing by your loyal followers. Clearly, we believe in a multi-channel approach that takes advantage of the unique benefits of traditional with the expediency and affordability of digital. The key is to have a deep understanding of your target audience and the competitive landscape to establish strategies for which methods and mixes will work best to reach your objectives.